On February 23, 1939, the 11th Academy Awards were held at the Biltmore Hotel in Los Angeles, California. That night, Walt Disney was awarded an Academy Honorary Award for the full-length animated feature film Snow White and the Seven Dwarfs. A special statue was created for this honor, featuring one regular size Oscar along with seven miniature statuettes on a step platform. 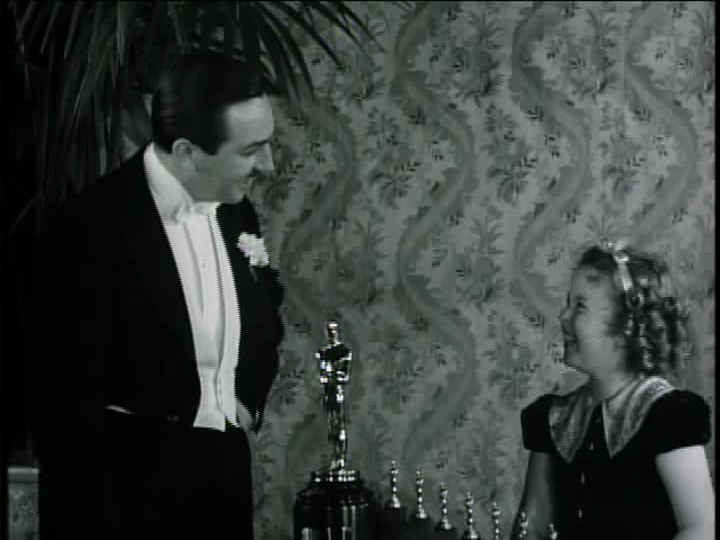 This award was presented to Walt by actress Shirley Temple. Posted in Uncategorized and tagged 1930s, Academy Award winning, Animated Feature Film, Color, Walt Disney. Bookmark the permalink.